A new and unique work by Cardiff-based dance company, Striking Attitudes is combining the creative talents of young Welsh choreographers with the unique experience and physicality of older professional dancers, at a stage in their career when dancers traditionally hung up their dance shoes in retirement. 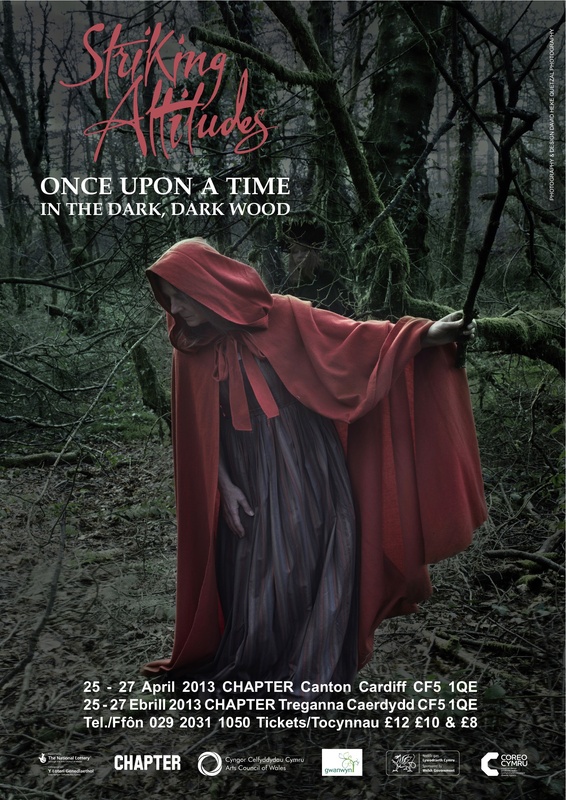 Set within the dark forests of fairy tales and legends, Once Upon a Time in the Dark, Dark Wood is a daring venture by Striking Attitudes. Artistic Director and seasoned Choreographer Caroline Lamb is collaborating with three young choreographers; Jessie Brett, Catherine Young and Jo Young to create a work which challenges conventional ideas about dance and raises the question; what does it mean to be a dancer? Once Upon a Time in the Dark, Dark Wood will be a brave encounter between seasoned older dancers – skilled and experienced in their craft, but with their physicality threatened by time, and the vigorous enthusiasm of the younger choreographers. Professional dancers who act, actors who dance, and a group of older dancers from the community will face risky and creative challenges. How will the older dancers deal with the physical demands of the young choreographers? How will the young choreographers unearth the hidden abilities of the older dancers? This new work by Striking Attitudes will test, but ultimately celebrate the skills of the mature dancer. “It’s re-awakening. We’re going back and discovering things in new ways. It’s actually quite exposing. We’re all pushing ourselves, physically and emotionally, and it is exciting” – Artistic Director, choreographer and dancer, Caroline Lamb. The first week of rehearsals for Once Upon A Time In The Dark, Dark Wood is over. In this candid interview, Artistic Director, choreographer, and dancer Caroline Lamb reflects upon this unusual combination of older dancers working with younger choreographers, and the challenges this has posed. It’s the end of the first week of rehearsals for Once Upon A Time In The Dark, Dark Wood. How have you and the older professionals found working with the younger choreographers and their approach to choreographing? It is very interesting, seeing the younger choreographer’s different approach to working. They work a lot with improvisation, and with ways in which we naturally move. Jessie [Brett] did an exercise about ‘muscles, skin, and bones’, encouraging us to look at how each of these individual components contribute to the way in which we move. They are working in a very ‘organic’ way, where we as the dancers come up with our own responses. As an older dancer, how have you responded to this different approach? You’ve learnt over the years to cover up the things you think you don’t do very well as a dancer. Now you’re having to find ways of doing them again. You’re exposing yourself, not just your strengths, but your flaws too. Jo [Young] has given us some very interesting tasks to do creating detailed movement from pictures. I’ve loved doing it but I am aware that my muscle memory is a bit rusty! Are there any particular elements that you’ve struggled with? The younger choreographers use laptops and cameras, which of course is different to how I work. They record us dancing and then watch the material of the dancers improvising. When they see something they like, they show us, and we attempt to re-create it. For me, that is a tough thing to do – trying to work it out bit by bit is very hard. I feel more comfortable improvising and then setting the piece. The younger choreographers approach involves the dancers opening up and giving a lot. It’s been quite emotional. I’ve found I’ve been holding a lot of tension in my chest. Initially, I was resisting ideas, I was struggling. As we went on, I let go more. It was very re-assuring. You are releasing and letting go. A lot of the time my work is about ‘holding on’, about how tough life is and the choice of either collapsing and giving up, or holding in there. You learn that as you get older, you need to somehow deal with things, despite painful or tough situations. Have you found the work physically challenging? Yes, we are all complaining of lower back pain! We’re all older and our bodies are not as strong. It can leave you feeling a bit vulnerable. It is challenging, physically and emotionally, but this is what the production is about. We’re all pushing ourselves, and it is exciting. It’s been joyous seeing how much everyone can still do despite their age, and how vibrant the mature dancers still look. We are thrilled to be working on an exciting new performance project for Spring 2013. Entitled Once Upon A Time In The Dark, Dark, Wood, Striking Attitudes’ Artistic Director, Caroline Lamb will be leading three young choreographers to create three distinct yet connected dance pieces with additional sections choreographed by Caroline drawing them together. The result will be a complete and emotive new work based on the idea of ‘time’ and rooted in the tradition of fairy stories – where all is not as it seems. This will be a unique opportunity for some of the professional dancers from the Striking Attitudes group to work alongside the fresh ideas of some of Wales’ newest, exciting young choreographers; blending the more mature body with youthful, cutting-edge choreography. 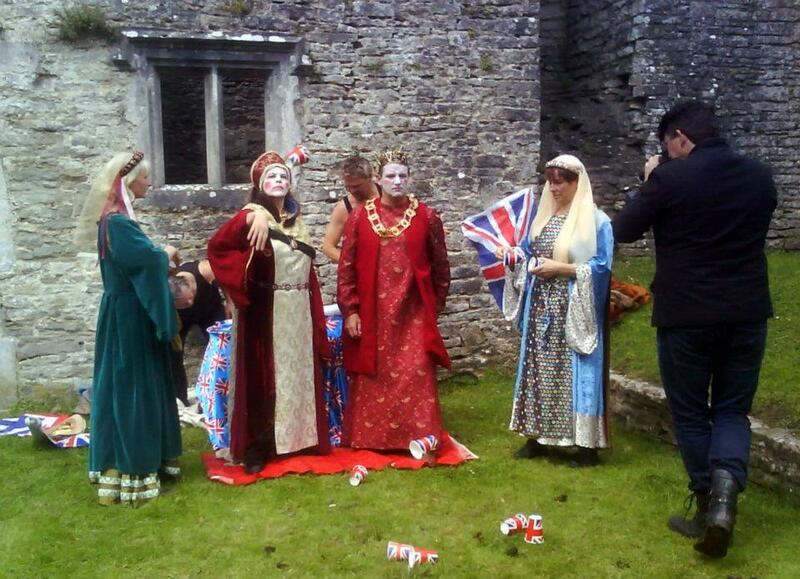 The project will involve a tour including three performances in Cardiff, Swansea and Ceredigion. Local community dance groups will make a small but significant appearance. And this is where you can be involved! Striking Attitudes community dance classes will begin on February 13th to work towards the Cardiff performances and we would love you to be a part of this. Classes will take place from 6.45pm-8.45pm every Wednesday in the Venue Common Room at Chapter Arts Centre in Canton, Cardiff from Wednesday February 13th until April 17th. The cost for the entire 10 week term is £80 (just £8 per 2 hour class). If you would like to be involved or for more information on the classes, please contact Anne Keeling at 02920 712265 or Janet Fieldsend at 02920 482413. “Deep down in the dark, dark wood and further beyond, in the sinister, brooding forest, secrets and stories lie, waiting to be revealed. In a dreamlike realm beyond reality, strangers travel through an eerie forest landscape, with only the fear of the unknown to keep them company, as they hunt for what was, what is and what might be. With few paths to guide them through the tangled undergrowth of long forgotten things, as they search an unexpected magic unfolds, that takes them into strange new worlds. Once Upon A Time In The Dark, Dark, Wood will be a unique evening of dance and theatre from Striking Attitudes that brings two generations of dancers together and asks what it means to be a dancer? Three young choreographers; Jessie Brett, Catherine Young and Jo Young with choreographer and Artistic Director of Striking Attitudes, Caroline Lamb, assisted by Janet Fieldsend, create a work set within the dark forests of fairy tales and legends where anything can happen and all is not as it seems. Using professional dancers who act and actors who dance, and joined by a group of local older dancers from the community, this is a work that sets out to celebrate the particular skills of the more mature dancer. With a rich mix of dance, text and music commissioned from the young composers of the Royal Welsh College of Music and Drama, supervised by John Hardy and with lighting from Dave Roxborough, this is a new and exciting venture in the landscape of dance from Wales. Once Upon A Time In The Dark, Dark, Wood is a brave encounter between seasoned older dancers – skilled and experienced in their craft, but with their physicality threatened and changed by time – and the vigorous enthusiasm and fresh approaches of the younger choreographers. How will the young choreographers harness the depth of physical knowledge and unearth the hidden abilities of the older dancers and how will the older dancers deal with the physical demands of the young choreographers? Daring, risky and creative challenges lie ahead for all. Once Upon A Time In The Dark, Dark, Wood will tour in Cardiff, Swansea and Ceredigion April and May 2013. Striking Attitudes is thrilled to have been awarded an Arts Council of Wales grant for this new project. Striking Attitudes were invited to show FOOTFALLS as part of the Festival of British Cinema. We would like to thank the festival for the opportunity to share the work we have produced. We were thrilled to have been invited by Andy Eagle, Chapter Art Centre’s new director, to show FOOTFALLS before the Wim Wenders film PINA, about the great German choreographer Pina Bausch, at Chapter Arts Centre on Sunday July 1st. The two films marked the end of the Wales Dance Symposium which took place at the Sherman Theatre and Chapter Arts Centre between June 29th and July 1st. We are very grateful to Andy Eagle and Chapter for their support.